Everywhere one looks the old ways are being questioned and familiar social fabric, in many instances are torn to shreds – from the Face-book revolutions of North Africa to the ‘Occupy Wall St’ campaigners in New York and around the western world. Gov’t and policy makers will, more than ever, have to stay ahead of the game or face rebuff or even overthrow. Yes, it has taken a number of years but the passing of the millennium (2000) has finally proven to be the watershed in human history that was long predicted. In the last 10 years we can clearly see that it is now the age of the citizen. The era of personal rights has now fully blossomed. No longer is the common man a mere cog in the political process – he is the political process. No longer are citizens content to be told what is good for them – patronising voters no longer works. Ordinary citizens will not tolerate being told what they can and can’t have in this ‘second generation’ of freedom. The ‘Stop Online Piracy Act’ (SOPA), which would have affected the humble enjoyment millions of ‘ordinary citizens’ has been rejected by them and citizen power has stopped the legislation in its tracks. The same fate has befallen ‘PIPA’ (Protect Intellectual Property Act). Both were direct assaults by corporate greed on the rights and freedoms of the individual. This has meant that all across Europe the child custody debate has moved to the top of the political agenda. The battle lines are essentially the stark choice between remaining with mother-only-custody of the child versus shared parenting where both parents are participants in child custody and care. Much is at stake – not just for old-school-feminists, who support the former failed regime, and fathers, who support the latter, but for children and whether the balanced, healthy society we all seek will become a reality. This is a clash that must be won. It cannot become, as American author Warren Farrell famously put it, an undeclared war won on a battlefield where only one side turned up. The question today is whether children in the post-divorce scenario grow up to be a liability and burden on the state, or a glistening jewel in society’s crown ? This cannot be done under the present regime of mother-only-custody found in most European countries. A fact that is being increasingly recognised in many quarters. “Our vision is to establish that, under normal circumstances, a child will have relationship with both his and her parents, regardless of their relationship with each other. Britain is not alone in Europe in recognising it is time to give children and father’s legal rights after divorce.Sweden and Belgium have enacted notable reforming legislation. Traditionally, the right in politics has tried to support the family by championing financial incentives and fighting a cultural battle against those who don’t conform. For its part the traditional left in politics has promised freer, less permanent, more liberal matrimonial ties and encouraged alternative life styles based on human liberties and sexual orientation. Both left and right have ‘won’ particular battles – but lost in the process have lost the war. It has been a Pyrrhic Victory. Yes, the battle for radical social reform has been won but it has been at such a cost and so socially disruptive that the victory is tantamount to a defeat. The monetary cost of reform both by both left and right political parties reforms is large but the social cost are larger and it is only now that a realisation is growing that some alleged ‘social reforms’ are actually counter-productive. The collateral damage caused by a system of divorce and custody that suits no one, costs every one dearly. Governments in the EU spend billion of Euros every year; the cost of legal cases, salaries of judges; the compensation required when losing the matrimonial home; the legal fees paid; the cost of lost production are also ‘time’ cost that can never be recovered. the downstream costs comprise criminality and anti-social behavior, drug addiction and a high incidence of ‘run-aways’ from home; and for girls, higher probability of teenager pregnancies. The costs of our present failed system thus racks up all these costs as each year goes by. Those children need not only clothing, shoes and shelter but medicines, visits to doctors, hospital treatment, dentists, opticians, medication and education (to name but a few). All those bills the tax-payer has to pay and for no fault of his own, his standard of living – and that of his wife and children – declines. Is it any wonder that a few years ago – long before the present economic recession – countries like New Zealand had to abandon all military spending and had to sell off their entire Air Force and most of their Navy ? So great had been their social packages and ‘wage’ compensation benefits they are now an undefended country. The state has too often seen itself as a better parent then the biological parent. Now the state is finally realising it cannot create ‘happy families’ or broker amicable break-ups. This has been the problem all across Europe- loving parents are being pushed out of their children’s lives for no good reason (in the majority of cases). One British Government official said this year that they wanted to remove any “in-built legal bias against the father or the mother” in the law. “[ the issue ] is about the children. Both parents should have a full and continuing role in a child’s life after they separate. “Where there are no significant welfare issues, we would want to see this principle reinforced through law. We will make a legislative statement emphasising the importance of children having an ongoing relationship with both their parents at separation, when it is safe and in the child’s best interests. This is no more and no less than what is required and requested by fathers groups in every land across Europe and North America. The reason why this problem appears so widely spread is because of changes in legislation that all copied one another in the decade’s after 1960. This is not unique occurrence; one only has to look at divorce reform, meaning easier divorces and domestic violence legislation to see that they vary little in content from one nation to another. In the case of divorce reform the year of implementation across a gamut of countries looks ominously like orchestration – it all happened between the years 1968 – 1971. Opponents of Shared Parenting are happy to confuse two different concepts namely that of strict/rigid allocations of “equal time” that a child spends with each parent, with Shared Parenting which gives both parents reasonable amounts of time with their child depending on their working hours and domestic load. In the past the terms Equal Parenting and Shared Parenting have sometimes been synonymous, with different countries preferring to use one term in favour of the other while all meaning the same arrangements. That now is slowly changing to one where Equal Parenting starts from a premise of equal parenting time subject to it being practical and parents agreeing. Shared Parenting starts from the premise that fatherly contact with children should be more generous than the 14% granted per annum at present and should, subject to mutual agreement be closer to 30 / 70, or 40 / 60, depending on work, family and home commitments. This view is endorsed by a poll of readers in the Daily Telegraph (80% in favour) and reinforces polls carried out in Australia where shared parenting was introduced in 2006. “ . . . we need to do much more to ensure that fathers play their full part in the lives of their children.” Telegraph Feb 2012. “Boys in rigidly sustained shared care were most likely to have Hyperactivity/Inattention scores in the clinical/borderline range.” – Jennifer McIntosh. “Fathers with shared care arrangements were the most satisfied with the arrangement, despite reporting higher levels of on-going conflict about parenting and poorer dispute management.” – Jennifer McIntosh. Jennifer McIntosh has not examined the situation carefully enough or is deliberately misconstruing what she has been told. No one is asking for ‘rigidly’ imposed shared care orders for children. Her “shared care arrangements” definition it later transpires is what everyone else calls sole mother custody, i.e. fathers having only minimal contact at weekends. What Jennifer McIntosh and her ilk are measuring in many instances are actually sole mother custody awards and perversely their conclusions coincide with the findings of fathers’ groups, namely, that children brought up in households headed by single mothers and no fathers display a variety of pathologies. Where father are only allowed to visit for a few hours per week / per day children will display a). high hyperactivity / inattention and, b). higher levels of on-going conflict about parenting and more disputes. That is precisely our argument. In years gone by, when government thought it knew best, government policies went out of their way to prevent this happening. Simple matters like recording the father’s name on the child’s birth certificate were left to fall into disuse thus undermining the important role fathers can play in a child’s sense of identity. Cultural signals and social norms do influence behaviour and the costs of relationship breakdown, of children left fatherless, of men behaving badly, are borne by us all. Politicians are forever trying to ‘signal’ to the markets their displeasureatcertain actions or to prevent certain decisions yet seem genuinely surprise thattheir policies and signals have shut out fathers from children’s lives. But when the state offers incentives and rewards for relationship breakdown then those cultural signals have, for political reasons, been unmentioned. Equally, when the state has encouraged fatherless by its welfare payments policies, the cost is borne by society and the cause never debated. Profit and wealth were for a long time after 1945 terms and concepts held in disdain. Indeed, they are not so universally approved of today but without a greater spread of profit and wealth countries likeGreece will not quickly overcome her problems. So, while all European countries try to figure out how they can pump wealth into their deflated economies, it is instructive to view the increasing numbers of fathers separated from their children in terms of wealth generation and in particular of wealth accumulation. As wealth producers, single men and women are comparable at1.0, but it is the married man who at 1.7 is the true ‘engine of wealth generation’ in any economy. Even if the married man’s wealth generating capacity is coupled to his wife’s, their joint capacity still exceeds that of combining cohabiting single couples. The reason for this is simple – the married man has a long term ‘investment’ in society – he has an investment in his family, i.e. his children. His children are his society (see Popenoe D, Annex A). Take his children away and he immediately becomes a single man again without that any investment. An inefficient use of resources can be tolerated in economically good times but are near-suicidal in times of economic hardship. As long ago as the mid-1970s these distinct trends became apparent to George Gilder who was then a US Presidential adviser (“Men and Marriage“); they were validated in 1990 by Amneus in his book “The Garbage Generation”; and the distinct categories were again endorsed in 1993 by Patricia Hewitt & Penelope Leach in their IPPR paper. The media is forever happy to depict men and fathers as all behaving badly or label them as being feckless, but where men and fathers are given the right opportunities they rise to the occasion and show their maturity the dividends are handsome. Those societies which help fathers play their full, and equal, role enjoy greater family stability as a result. In Sweden, the introduction of flexible parental leave helped increase the amount of time fathers spent with their young children and helped the divorce rate fall by 30%. In Belgium and Australia, which introduced new shared parenting laws in the same year, it will only take a few more years to establish a reliable and identifiable trend – but we can predict it will have much to commend it. It’s important that we see parenting as a shared responsibility, with fathers playing an equal and complementary role, to mothers. It is not enough to simply legislate and say that fathers now have ‘joint responsibility’ – it must be tangible; there must be meat on the bone, and substance not simply rhetoric. Over the past 40 years marriage itself has changed and fatherhood within those marriages has also changed. Men are far more ‘hands on’ than they used to be. And where relationships do founder (i.e. end in divorce), it’s important also thatwe ensure fathers play the fullest possible role in those circumstances. In so doing we guarantee the emotional stability so essential for the children involved for make no mistake the outcomes for children in terms of morbidity and mortality, are far better where fathers are actively engaged with their children through the growing up years. If we want children to be those jewels in the crown then we can wait no longer for reform. The other paths have been tried and shown to fail. Now we need to take the path that the people want. In Nov 2011, Linda Nielsen, Professor of Women’s Studies, Wake Forest University, in North Carolina, USA, published a paper entitled “Shared Parenting After Divorce: A Review of Shared Residential Parenting Research” (ref http://dx.doi.org/10.1080/10502556.2011.619913 ). One of the most complex and compelling issues confronting policymakers, parents, and the family court system is what type of parenting plan is most beneficial for children after their parents’ divorce. How much time should children live with each parent? How are these children and their parents faring? In what ways, if any, do divorced parents who share the residential parenting differ from parents whose children live almost exclusively with their mother? How stable are shared residential parenting plans? By reviewing the existing studies on shared parenting families, these questions are addressed. What is the most beneficial living arrangement in terms of its impact on the well-being of children has been the Holy Grail of law makers and courts for many decades ? Sometimes Social Scientists have obfuscated the issues; sometimes they have preferred not to be drawn one way or the other. In the absence of leadership we have, on the one hand, reluctance to change and on the other, an inability to present information clearly. Clearly, in such circumstances another avenue has to be found that gives us a better insight into the impact on children. Leaving aside the personal and political prejudices of many of those that have shaped child custody and welfare matters since 1945 it has fallen to ‘outcomes’ to be that new avenue. The advantage ‘outcomes’ presents to policy makers is that they carry no political baggage, no academic reputations are in jeopardy and they are objective measures. The data is based not on a small self-selecting sample but on a much larger random population which makes their accuracy (and relevance) far greater. The paper by Linda Nielsen lists those ‘outcomes’ and helps show us the way; her paper builds on the work done by other modern researchers. “How much time should children live with each of their parents in families where both parents are fit and loving ? “Do children benefit from living with both parents at least 35% of the time ? And if children do benefit how and why does this come about ? Equally, children where the father is not present statistically suffer higher ‘morbidity rates’, i.e. rates of illnesses and accidents.’ This distinction applies regardless of country. So, firstly, do parents who share residential custody differ in significant ways from the majority of divorced parents whose children live almost exclusively with their mother ? And secondly, why is the IQ and ‘life chances’ of children brought up with a fathers present so much higher ? In the past 20 years these questions have become increasingly relevant foratleast three reasons. Firstly, shared residential custody is becoming more prevalent. Until recently only 5% to 7% of children lived at least one third of the time with their father. Most children of divorce lived exclusively with their mother, spending only four or five nights a month -at most – in their father’s home (Kelly, 2007). Translated into time this equates to 14% to the father and 86% to the mother. However, a change is clearly underway all over Europe – in the Netherlands, Denmark, and Sweden18% to 20% of children whose parents have separated are in shared residential custody (Smyth, 2009; Spruijt & Duindam, 2010). Belgium which as not mentioned by Linda Nielsen, adopted in 2006 a reform for the time allocated to fathers. The same change is underway in Australia where shared parenting was enacted in 2006. In the USA,Arizona and in Washington State have between 30% to 50% of the children whose parents divorced in the past several years are living at least one third of the time with each parent (Ref. George, 2008; Venohr & Kaunelis, 2008). In Wisconsin, a study by Melli & Brown (in 2008) revealed that30% of the children whose parents divorced between 1996 and 2001 were in shared parenting arrangements. Secondly, the question of shared residential custody has become increasingly relevant for the majority of people who want to live in a society of equals and of equal opportunity. In an era where young fathers are more obviously engaged with their young children why should they be excluded once a divorce occurs ? In a variety of surveys over a number of years the public has declared its support for shared parenting. In a 2004 a poll in Massachusetts showed 85% of the voters (530,000 people) wanted shared parenting. The figures for England obtained by the Dept of Constitutional Affairs are in the 70% range. Surveys of young people, i.e. tomorrow’s parents, show the same sort of range, i.e. 70% – 80%. Thirdly, given that the question of shared residential custody has climbed up the political agenda in a big way and is competing for the attention of legislators and politicians many of them (and the professions) need to become familiar with what it entails and the many benefits to all parties that ensue. Regardless of regime of law – be it common law or continental statue law – the changes proposed entail a “presumption” of equal residential custody. This would mean that where parents reach a mutual agreement (using a parenting plan), the time the child or children spends with each parent can be as flexible and as varied as each parent finds it comfortable. Where parents cannot reach a mutual agreement on the kind of parenting plan they think is best for their children, the children would live equal time with each of them as long as both were “fit and loving” parents. This is often enough to break the log jam of ‘difficult parent (s)’, for both parents would soon realise that their work, social and home life would be put under strain and curtailed. It is perhaps a reflection of our times that a book entitled “Collateral damage: the lived experiences of divorced mothers without custody” can be written and cause no ruffles. The proportion of such divorced mothers amounts to no more than 5% -7% of all divorced mothers, yet no book has been written dealing with the collateral damage: the lived experiences of divorced fathers without custody, who represent over 90% of divorced men and an army numbering tens of millions. In part this absence of the other side’s case is due to funding being made available for one style of survey but not another. Single mothers have long been an issue high on political agenda and this has crowded out researchers looking at the other side of the coin single fathers and fathers without children. The next diagram shows ‘outcomes’ for children lists 13 studies into shared parenting and the benefits ensuing. The studies cover the years 1991 to 2010. With very few exceptions all show ‘better adjustment’ in shared parenting living arrangements. Only in a few studies are ‘outcomes’ listed as being the same as single parent custody which perhaps reflects the design of the study more than the true variation. Breivik & Olweus conclude that in matters academic, drugs and alcohol there is no difference. In the study by Spruijt & Duindam, other work by Spruijt would lead one to conclude this to be in line with his personal beliefs. All the other above studies conclude – as Bauserman did in his meta-analysis – that children are better off (better adjusted) in shared parenting living arrangements. Importantly, none of them show worse or bad outcomes. Hasn’t the opposition to fathers being more involved in their children’s lives forever rested on the premise on the damage and negative impact they can cause ? The answer to that is ‘yes’ it has and one then has to look for the reason why such a view was ever held – and it is not long in the finding. It was in the 1930s that this once small group became too big to ignore. It was in that period, that the term ‘juvenile delinquent’ came to the public’s attention through American gangster and police films of the period. Children from broken homes would go on from juvenile hall to commit bigger crimes and end up in jail despite the best intentions of their probation officer. At about the same time academics such as John Bowlby and Anna Freud began examining the effects of orphaned children and children with psychological damage. The merging of the juvenile delinquent’ with the psychologically damaged, orphaned and/or traumatised child happened without anyone noticing their distinct pedigrees. Anna Freud – herself a psychologically damaged child with numerous sexual and social dysfunctions – began her work among Jewish children in Vienna in the 1930s. That work was cut short by the arrival of a Nazi regime in Austria and her escape to England. However, one client Dorothy Burlingham, followed her to London. Dorothy Burlingham believed all her 4 children needed help and for the next 40 years were be put under the psychological control of Anna Freud. The results were not glorious. All the children became psychologically mixed up and confused. All the children suffered from alcoholism and drug abuse with several overdoses. In 1970 Robert Burlingham Jr. (Dorothy Burlingham’s only son) reportedly committed suicide aged just 55, and in 1974 a daughter ‘Mabbie’ booked an appointment with Anna Freud and then, as a statement, committed suicide in Freud’s own home. (see “Anna Freud: Part 1 – Her secret failure”, http://robertwhiston.wordpress.com/2009/09/01/0013/). But all that was an ‘outcome’ waiting to happen – waiting to be chronicled. Meanwhile in the 1940s Anna Freud had renewed her interest with children by focusing on those orphaned and traumatised during the Luftwaffe Blitz on Londonin the 1940s. This work was expanded by generous US funding at a new carried on Hampstead Nurseries, Hampstead in London (later called “Hampstead Child Clinic”). Still later, after 1945 she opened Bulldogs Banks and experimented with 6 very young feral Jewish children rescued from a concentration camp. For 40 years Winnicott had worked at Paddington Green Children’s as a paediatrician and child psychoanalyst and during World War II he served as consultant psychiatrist to the evacuee programme. John Bowlby is best known for his “hierarchy of attachment” theory. Briefly stated this believes that mothers are the prime and normally the only caregiver a children recognises and forms a bond with in the early months of life. This we now know is a reflection of the social norms of the time and not true science since it has been shown many times in subsequent studies (e.g. Prof Michael Rutter, Richard A. Warshak etc), that infants can and do form bonds with fathers or other close and constant relatives. Indeed, one might say that Freud’s creation of a ‘psychological parent’ cuts the very ground from under Bowlby’s thesis about the centrality of mothers. But it was Anna Freud and her circle that became absurdly influential in government policy circles in the decades after 1945. The state had during World War II – even in advanced democracies – run government on the basis of a ‘command economy’ which meant it intrudedatall levels. And one has to admit it was essential when civilisation itself was put in peril. However, like all acquired tastes it became a hard habit to break. Bowlby’s, 1944 famous paper “The Thieves Study” focused on maternal deprivation. He believed that the infant and its mother bond during the first five years of life were most crucial to socialisation. Disruption of this primary relationship could lead to a higher incidence of juvenile delinquency, emotional difficulties and antisocial behaviour. To support his hypothesis, he studied 44 adolescent juvenile delinquents in a child guidance clinic. In a later paper, he reported that 60 children who had spent time apart from their mothers in a tuberculosis sanatorium before the age of 4 showed lower school achievement. For instance, a 1962 World Health Organisation paper ‘Deprivation of maternal care: A Reassessment of its Effects’ by Mary Ainsworth et al,  contains a chapter called ‘Review of Findings and Controversy,’ in which the distinction between ‘separation’ from a parent and ‘parental deprivation’ is carefully set out in an unbundled way. It was written with Bowlby’s approval as a vehicle to present the more recent research and developments of the 1960s and to address misapprehensions. This publication alsoattempted to address the previous lack of evidence on the effects of paternal deprivation. Bowlby has been accused by his peers, e.g. Prof Rutter, of not distinguishing between deprivation and privation – the latter being the complete lack of an attachment bond, rather than its loss. Rutter stresses thatthe quality of the attachment bond is the most important factor, rather than just deprivation in the critical period. A view shared by American Prof. Warshak. It was not until 1995 that Dr Patricia Morgan pointed out the inconsistencies in many of these early studies. Firstly, they were of small sample sizes which skews any conclusions and secondly but most importantly, only mother absence was examined – not the presence or absence of fathers. Anna Freud’s series of book regarding “the best interests of the child” came at a time when the judiciary where searching for a scientific foundation for their custody awards. Her findings powerfully reinforced the gathering assumptions of the judiciary in Britain and the USA. In the instance of Britain, the judge appointed to interpret the new law was taken ill and his place was taken by Roger Ormrod who piloted the changes brought by the 1969 Divorce Reform Act. According to another judge (Robin Dunn) he had no time for fathers and single-handedly forced through his interpretations of the radically new law. But what of the authors of Anna Freud, Joseph Goldstein and Albert J. Solnit ? Anna, as was stated earlier, was dysfunctional in many ways. She was untrained and only qualified to be a school teacher – but her name was the totem required in the psychoanalytical world. Joseph Goldstein, although a Yale law professor, he studied and practiced meditation from 1967 onwards under the guidance of eminent teachers from India, Burma, and Tibet. Dorothy Burlingham, whose name sometimes appears on some early copies, was also wholly untrained. The Freudian doctrine rather overshadowed what Bowlby had actually said. It also eclipsed the conclusion that Roman & Haddad (1978) were groping towards in their studies. The attraction of the Freudian doctrine was perhaps its simplistic concept that allowed non-initiates to believe they had attained some form of profound truth. From the very beginning Freud, Goldstein and Solnit appear to have considered that joint residence posed some kind of threat. They maintained that authority over a child’s life needs to be clearly allocated to one parent, and that children suffer painful loyalty conflicts if they maintain contact with two parents who are not in a harmonious relationship with each other. 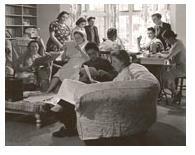 Indeed, examination of the contemporaneous photographs of the Hampstead Nurseries and of Bulldogs Banks show only a few male therapists and clinicians working with the children (see left ,the Anna Freud Centre website picture dated 1941). They are not seen as threats but biological fathers are excluded by a cordon sanitaire, i.e. quarantined. This theory has now been challenged and shown not to be wholly correct but it flies in the face of real parents experiences. What married couple have not discipline or control their children together as a team ? And how often is it that married couples have slightly different takes on the same situation yet their children grow up as outcomes prove to be better adjusted in all departments ? Q.1. Does the institution child develop differently from the child brought up in a family ? Q.2. Why does a child develop differently in an institution ? A. Anna Freud’s own research in 1943attwo residential nurseries (housing about 90 children) tells us the reasons. In other words the superficiality of middle class standards, e.g. table manners, have been learnt by rote but the underlying quality of the personality is absent. Finally, the single factor undercutting all of Freud’s work was her concentration on ‘orphaned’ and ‘traumatised’ children. Ever since her work was published “experts” and legal commentators have persisted in amalgamating public law, which deals with ‘orphaned’ and ‘traumatised’ children and private law which deals with divorce and far more balanced children than those from Nazi concentration camps or ‘blitzed’ traumatised children. 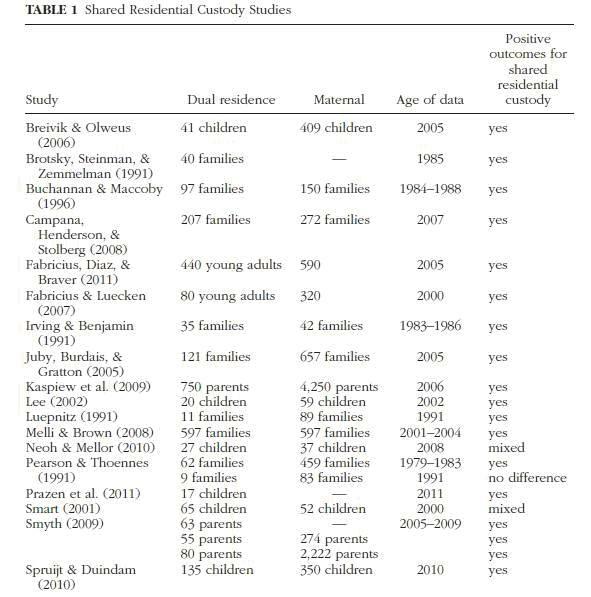 The following table (shared residential custody) is again taken from Dr. Linda Nielsen paper. It shows a goodly number of shared residence surveys and the sample size of each. But it also characterises the smallness of the surveys that have been used to support maternal custody only dogma over the years. The over-emphasis on maternal bonding and attachment theory is today recognised as misplaced. Yes, it is still valuable and vital but its value and vitality lies in its conjunction with paternal bonding. “The evening and overnight periods (like extended days with nap times) spent with non-residential parents are especially psychologically important not only for infants but for toddlers and young children as well.” – Family and Conciliation Courts Review, Vol. 38 NO. 3. “Evening and overnight periods provide opportunities for crucial social interactions and nurturing activities, including bathing, soothing hurts and anxieties, bedtime rituals, comforting in the middle of the night, and the reassurance and security of snuggling in the morning after awakening, that1-hour or 2-hour of visiting time cannot provide. These everyday activities promote and maintain trust and confidence in the parents while deepening and strengthening child-parent attachments. Indeed, as articulated above, there is substantial evidence regarding the benefits of these regular experiences. Aside from maintaining and deepening attachments, overnights provide children with a diversity of social, emotional, and cognitively stimulating experiences that promote adaptability and healthy development. In addition, meaningful father-child relationships may encourage fathers to remain involved in their children’s lives by making them feel enfranchised as parents. – Family and Conciliation Courts Review, Vol. 38 NO. 3. Other advantages of overnights which are often neglected in debate are the normal combination of leisure and “real” time that extended parenting affords each parent. As married couples with small children will identify with, a week end away from the kids recharges their own batteries. This enhances each parent’s ability to stay abreast of the constant and complex changes in the child’s development, opportunities for effective discipline and teaching that are central to good parenting. It also facilitates an opportunity to ‘reconnect’ with the child in a meaningful way. In contrast, brief 2-hour visits remind the infant that the visiting parents exist but do not provide the broad array of parenting activities that anchor the relationships in their minds (Kelly & Lamb 2000 p. 306). And as Tripp & Cockett were to discover in their Exeter University study of 1991 (pub’d HMSO) it is the departure and repeated departure of the parent that is the most enduring to a child’s memory. To break the bond between the child and one parent so arbitrarily is to destroy continuity of care. They argued, in 1991, that joint residence or shared parenting as it is now termed, allows both adults the gratification of parenting. The giant figure of David Popenoe, Professor of Sociology at Rutgers University, and an internationally acclaimed expert in these matters concurs. For over 20 year Popenoe has been at the forefront of social analysis. He has written widely on family structure and children in learned journals and books. His 1996 book “Life Without Father: Compelling New Evidence That Fatherhood and Marriage Are Indispensable for the Good of Children and Society” set new standards. Popenoe found – and he is one among many others since – that the relationship between ‘family structure’ and ‘crime’ is so strong that it erases the relationship between race and low income and crime. In short a city’s crime rate was set not by social exclusion or ethnicity but by a city’s divorce rate and the resulting fatherlessness rate. Given that America is in many social issues 20 year ahead ofEuropeif not 30 years in some less advanced countries, I leave you to draw your own conclusions. Some of the studies shown in the Table – as Neilson states – tend to have less random and smaller samples and some by today’s standards do not take into account confounding variables – those of the parents’ income, parents’ education, and levels of conflict. That said, these 20 shared residential studies are by their very diversity and their spread over time a representative sample of the results that can be expected from larger surveys i.e. longitudinal. They are unsurprisingly uniform in their conclusions about the positivity of shared parenting. Do most parents in shared parenting families differ in significant ways from other divorced parents ? Specifically, are they far better off financially or far more cooperative than other divorced parents ? Is shared parenting feasible only for a relatively small, selective group of parents. Are there any advantages for children who grow up in shared parenting families compared to those who live almost exclusively with their mother ? How do adolescents and young adults who have been raised in shared parenting and maternal residence families feel about the living arrangement that their parents chose for them? Which of these two parenting plans did they feel was in their best interest? How does the quality of the father–child relationship compare in shared parenting versus mother residence families ? The sample sizes listed in the table above are worryingly small from a statisticians and/or and actuaries perspective. Yet this is the basis on which headlines are founded and legal changes made. If it appears perverse to lament and moderately criticise the lack of larger studies we have to remind ourselves that surveys attempting to show negative impact on children of shared parenting often have sample sizes of 48 or 131. We should not be overly concerned regarding size of samples which support how important shared parenting is for children because they serve only to reinforce whatis found time and again in longitudinal study data. and more recently still, comparative data from a range of European countries and theUSA. Other European and Nordic countries have similar studies and in Sweden a survey of over 1 million children was undertaken. Using the national longitudinal data academics, such as Prof. Kathleen Kiernan and Dr Patricia Morgan, have since the 1990s been able to follow the progress of children from birth into adulthood. They have noted the educational attainment, employment, economic position, and family formation and dissolution patterns of these same children later in their lives. These events are referred to as “outcomes” and should not be confused with ‘results’ which imply an immediacy or reaction. The analysis of both US and British data showed that daughters living in households where there was no father figure were less likely to attain good school qualifications, to be more economically disadvantaged and more likely to have become young mothers than their contemporaries in the reference group of families where a father was present. Even after controlling for pre-disruption characteristics of the child and the family, including emotional problems, ‘cognitive’ achievement, and socio-economic status striking differences remained. The results show that by age 23, those children whose parents had divorced were more likely to leave home (because of friction), to cohabit, and to have a child outside marriage than were those whose parents did not divorce. Where are these children aged 23 to 30 to earn of the importance of having a father in their home ? Not at school – and certainly not from government agencies. How are they to reason out that the predicament they now finds themselves in was to a large degree pre-ordained by divorce and the act of court which pushed their father away from them ? Courts don’t mean to be monsters and mothers certainly don’t want to be seen as monsters – they only want what is best for the child. After all, courts are only awarding child custody on the allegedly ‘scientific’ basis they have been told is reliable, namely the work of Bowlby and Freud. The fact thatthe science in now 70 years old and is based on the experiences orphans should prompt, among the academic world, some rapid reassessment. Only creatures in film like King Kong, Alien or Godzilla are the true monsters. Bowlby and Freud don’t want to be seen as monsters and indeed they are not. They are human beings complete with human frailties. But ‘monster’ might yet be their epitaph when young people scarred by the divorce and custody process seriously begin looking for answers to their problems in the future. As recently as 2010, a paper by Amato & Dorius found that children of divorce benefit most when their father is actively engaged in their lives across a wide range of daily activities and when he is has an authoritative rather than a permissive or an authoritarian parenting style. If this is true – and it is a conclusion found in many papers – then limiting fathering time to weekends or to brief weekday visits is less likely to benefit children because the kinds of activities that build strong parent–child bonds and the promotion of positive, authoritative parenting are less likely to occur. Getting ready for school, working together on homework, going shopping and being together in spontaneous, unstructured ways brings mothers closer to their children, and Linda Nielsen finds the same is true of time and activities shared between children and fathers. It is this unexceptional, almost mundane, time together engaged in a broad range of daily activities with their father that promotes the best outcomes for children 15 years ago in 1997, a group of 18 nationally renowned experts in psychology, sociology, social welfare, and law concluded that divorced fathers needed more extensive and more “regular” kinds of time with their children to maintain a quality relationship (see Lamb, Sternberg, & Thompson, 1997). We discover, when we overview all the available data regarding fathers and their children, that when children live only with their mother, the majority of their fathers end up spending too little of the “right kind” of high-quality, authoritative parenting time with them (Amato, Meyers, & Emery, 2009). This alone has profound effects on both children and fathers. These profound effects among children can be depression and self-harm, drink and drug abuse etc. Profound effects among fathers also include depression but their self-harm turns into attempting suicide. Various reports allude to men feeling depressed, repressed and objectified. Modern fathers are said to be ‘less fertile’ and feel as if they are not essential to parenting. Have we made so many artificial social constructs, barriers and models that we are close to the point of implosion ? And if this is true not only of men but of women. How many of them feel pulled in more direction than their mothers ? How many of them also have fertility problems ? According to 2008 research reported in the Guardian a mothers chances of miscarriage, despite all the advances in lifestyle and medicine, have increased in recent times (see also 1st Dec 2011) and have actually doubled in some instances (3rd Aug 2008). Non-Resident Fathers have historically been officially marginalised and it should come as no surprise that the engagement with their children which had been encouraged throughout their married life turns into a disconnection and leaves them feeling depressed and repressed. “Non-Resident Fathers in Britain”, was a sub-set of divorce much overlooked so the exploration by Bradshaw, Stimson, Williams & Skinner from the Uni. of York in 1997 of these fathers was much overdue. Bradshaw, Stimson et al showed a linkage between the mothers’ vetoing of access rights for fathers and the fall in their compliance to pay child support. When fathers were allowed unfettered visitation by mutual arrangements and these times were not inexplicably changed at short notice, child support payments were more regular and more dependable (and larger). Further, the number and length of times a father visited his child increased as the gate keeping behaviour of the mother decreased. The typical custody arrangement of today only allows fathers and children to be together every other weekend and on occasional weeknights for a part of the evening. This means that most children only live with their father 14% of the time. These statistics suggest that maternal residence might not be the best parenting arrangements for many children because it might not be the best way to encourage or promote high-quality fathering time. Academics at the University of Newcastle, carried out a study in 2008 which found that men tended to pay slightly more attention to their sons than their daughters (and in real life one can suppose mothers spend a little more time with their daughters). (This is the key socialisation role that fathers uniquely play in the lives of all of their children). “What was surprising about this research was the real sizeable difference in the progress of children who benefited from paternal interest and how thirty years later, people whose dads were involved are more upwardly mobile. The differences, according to Dr. Nettle, were still detectable by the age of 42. Similar results have been documented by other long-term investigations. For instance, a 36 year long longitudinal study in the U.S. found that the children of affectionate fathers were much more likely in there forties to be happily married and mentally healthy and to report good relationships with friends (Franz, McClelland, & Weinburger 1991). Other examples are Warshak 1992 study and Snarey 1993 study which both found that the child with an available father, both in the early and the adolescent years, is more companionable and responsible as an adult.It is important to note at the outset that this article does not include studies based on the 10% to 15% of divorced parents in the high-conflict group. It is important to note at the outset that this article does not include studies based on the 10% to 15% of divorced parents in the high-conflict group. High-conflict families tend to be the Trojan horse most often used in debate to counter the argument in favour of shared parenting so a closer examination of the phenomenon is called for. Other methods of confusing the issue of shared parenting is to lump it together with having shared parenting forced upon couples by the courts or have courts impose a rigid 50/50 spilt in time allocation between both parents. The issue can on occasions be conflated with the matter of Parental Alienation Syndrome (PAS) as if it is some sort of permanent barrier to shared parenting. I shall now quickly deal with these few topics before returning to my main text. These adults display unrelenting hostility and/or conflicts and are generally physically aggressive and resort to threatening behaviour. It follows that designing a ‘parenting plan’ for this type of parents is a challenging if not an almost impossible task. The assessment in Britain- based on court cases – is that implacable mothers are a tiny but vocal minority, and that the other dilemma preventing amicably agreed “parenting arrangement” are hostile of high conflict families. CAFCASS which is in charge of family going through divorce estimate the number of intractable cases (their term for high conflict families and implacable mothers) as no more then 5% of the cases they see. Because these high-conflict couples consume so much time in family court and because their conflicts often involve physical abuse, much of the discussion of and objections to shared parenting have been focused on them (Johnston, Roseby, & Kuehnle, 2009; McIntosh, Burns, Dowd, & Gridley, 2010; Kuehnle & Drozd, 2012). They unfortunately also provide rich pickings for surveys which in due course receive extensive attention in the professional journals and the mainstream media. A case in point is the Australian Jennifer McIntosh who has actively sought to disrupt legislation inAustralia, interfere in Britain and hinder in Israel. The personal agenda of Jennifer McIntosh is anyone’s guess but it allows us at this juncture to highlight other unrelated issues which are normally used to deter the adoption of shared parenting. From the earliest days there has been an unspoken link between bipolar disorders and violence high conflict in the home where even the alleged world experts have skeletons in their cupboards. Look at Dorothy Burlingham, her husband was bipolar. Then look at Anna and Sigmund Freud. Her father would beat her and she developed sexual fanaticises (which came first is unclear from the literature). In 1919, aged 25, Anna developed clinical jealousy, depression and masochistic tendencies. In 1923 she published a paper which some have seen as ‘autobiographical’, recounting her experiences; ‘My father is beating the child whom I hate.” (Ref. “The Relation of Beating Phantasies to a Day Dream”). Later Anna Freud and Burlingham began a life long lesbian relationship. People like McIntosh and her colleagues (2010) are often cited to support the claim that shared parenting is harmful for most children. In a British law school journal Liz Trinder (2010) wrote a “review of recent research on shared parenting” which was actually based on only two studies of shared parenting families – one of which is McIntosh’s own study. The political leanings of both Liz Trinder and McIntosh are clearly colouring their objectivity (similarly with Mavis Maclean’s and Joan Hunt’s work on this area). Linda Nielsen found, as I had also found, that the problem with McIntosh’s studies (and various others of a similar persuasion) that they come from a small, non-random sample – in McIntosh’s study 69 – of shared parenting families in one case, most of whom were in the high-conflict groups and only 16 of whom had voluntarily chosen shared parenting. In another McIntosh study the sample was still too small at around 131. But closer examination of the actual paper and not the summary or the press release showed that the researchers had to conclude that the young children’s higher anxiety scores were more closely correlated with the father’s low education, the parents’ high conflict, and the mother’s poor parenting skills, than with the shared residential parenting or high conflict alone (McIntosh et al., 2010). This does not of course make for attention grabbing headlines. The work of supposed researchers that include Kelly, Joan Hunt, Liz Trinder, Brenda Neale and Jenn McIntosh all manage to insert in the text, either as a fact or simply as an act of faith, thatsuch shared parenting when forced upon couples prove unworkable. Who is arguing with that ? Father’s organisations do not want custody arrangements forced upon anyone. At present we have parenting arrangements forced upon parents and we know how useless they are – indeed, that is why a change to mutually agreed shared parenting is being sought. “ . . . This enforced contact was successful in all cases involving children under 5, in 80% of cases with children aged 5-7, and in 40% of older children. Notice how the greater the age (and presumably the longer the time before professional ‘intervention’) the less the will be success rate. To round off this diversion I would like go back to CAFCASS which is responsible for writing reports for the divorce court on the welfare and allocation of children caught up in their parent’s divorce. In the process we shall revisit some of the distortions and economies of truth that frequently plague the issue of divorce and custody. In 2002 meeting held with senior civil servants led to them insisting that the Children Act 1989 was never intended to be used for shared parenting. Ten years later a document which can now be found on the internet shows that shared parenting was the intention of the Act but that unofficially Government advised judges that they should never use it. This frustrated any reform CAFCASS could have brought to child allocation. Secondly, and again linked to CAFCASS the minister responsible, Lord Falconer, asked the statistical service ONS to provide him with data showing thatonly a small percentage of parents were unhappy with custody arrangements. The figure he received in 2004 was that only 10% of parents were ‘unhappy with custody decisions and therefore the problem was not big enough to warrant time being spent on it. The figures he relied upon were taken from the ONS’s Omnibus Survey – a survey of only of 935 adults. Once again, smallness of sample size lead to inaccuracies. The truth of the matter is that each year, to quote a government official report, “between 150,000 and 200,000 parental couples separate”. Ten percent of a divorce/separation of that total would give rise to 15,000 ‘unhappy parents.’ Yet CAFCASS deals with between with between 45,000 and 65,000 private law cases of unhappy parents every year (three of four times the 10% figure). In CAFCASS’s 2004 Annual Report 33,803 private law cases involving 73,937 children are ‘handled by CAFCASS. In 2011 there were 45,000 separate private law applications  but those private law applications involved – and this is the key number – 147,000 children. Worryingly for the public is that parents in the lower working class are not alone in attracting the attention of government child officials. The educated middle class parents and mothers who normally would have had no involvement with Social Services are finding themselves increasingly tangled up as officialdom expands it regime of safeguard ‘screening’ procedures. “Social services don’t always understand our role properly either. My presentation today advocating the greater merits of shared parenting over any other alternative concludes by stating the obvious – we need to legislate and change policy not for the 5% or 10% but for the 95%. We are not advocating change for change sake nor are we advocating change to benefit one parent over the other. No, we are advocating change for those 147,000 children that hardly get a mention and hare hidden inside the less alarming 45,000 figure. We cannot allow an unrepresentative 5% to hold society hostage against much needed reform. If 90% of women wanted access to birth control or, say, 90% of women wanted to be screened to detect the early onset of breast cancer (or cervical cancer), would we let a 5% or 10% minority who were vehemently opposed to the measures on ethical grounds win the argument ? No. My presentation today, therefore, has concentrated on the remaining 90% of divorced parents and excluded the small unrepresentative 10% of couples that fall into the conflict / dysfunctional category. They can and should be dealt with under a separate and quite tailored scheme suitable for their needs and situation. Belinda Fehlberg shares McIntosh’s views and since 2006 has written profusely in her support. Fehlberg is well placed to get the McIntosh narrative and agenda into the mainstream press as she is on the editorial board of the Australian Journal of Family Law. Sydney Morning Herald of Dec 2011. Reading the details, however, it is clearly a press release aimed at maximising self-publicity. Based on a study of only 258 children from separated parents the gist of it said that non-custodial parents, i.e. 90% of whom are separated fathers, should see children up to three times a week and then gradually phase in overnight visits after the second birthday. This is probably what happens in most instances, so nothing radical there. But then the objectivity is ruptured by muddling it with high conflict family and family courts. There is also confusion in McIntosh’s work in that she ascribes shared parenting to mean a child who stays weekends with his father. This we have earlier referred to as disingenuous by researchers and as the 14% father factor. How often have we heard this criticism levelled at some fathers that they “disengage”; that they fail to remain involved in their children’s lives ? The reason in many cases is that they are pushed away by the custody regime adopted by the country in which they live. They are penalised and made vulnerable by the withholding of visiting time should the parent-with-custody so choose. Let me re-confirm again – we are speaking her of the 90% of divorcing families where controversy is not an issue. We are not dealing with the 5% to 10% of dysfunctional families who present problems for professional workers. It is now generally accepted as an incontrovertible truth – except among die-hard radical feminists – that non-residential fathering time is beneficial and is closely related to the quality and the endurance of the father-and-child relationship. We would, therefore, expect that fathers and children in shared parenting families would have better relationships than children and fathers who do not live together at least a third of the time. Is there any evidence thatliving together more than a couple of weekends a month is associated with stronger or more enduring bonds between fathers and children ? Even adolescents, who can be the most trying, i.e. most difficult, age group for parent s to handle, who spent only slightly more time with their father had measureable closer relationship compared with those that saw their father only during the day. This Cashmore, Parkinson, & Taylor (2008), found held true even when the overall amount of time both groups spent together with their father was equal and regardless of the amount of ‘conflict’ between the parents. The supposition by Cashmore, Parkinson, & Taylor, was that this relaxed normative time together helped adolescents and appreciate their bonds with their fathers in more powerful ways. Are, you ask, the number of days spent living with their father directly related to the quality of their relationship years after the parents’ divorce ? “ . . . . the most methodologically sophisticated study is based on 1,030 university students whose parents divorced before they were 16 (Fabricius, Diaz, & Braver, 2011). Nearly 400 of them had lived in shared parenting families after their parents separated. The number of days they lived with their fathers each month and the present quality of their relationships were highly correlated. That is to say, the more days they had lived together each month, the higher they rated the quality of their present relationship. The amount of time these fathers and children had spent together after the parents’ divorce ranged from never up to 50% of the time. Does additional time together have any impact on the very worst relationships or only the very best relationships that children had with their fathers ? To answer this question, the researchers analyzed the correlations for the “best” and the “worst” 20% of child-father relationships. If we assume that the fathers in the top 20% would have had great relationships with their children (regardless of how much time they lived together), then time should not be highly correlated with the relationship quality for this group. Equally, ‘time’ should not be associated with the quality of the relationship for the 20% with the worst relationships. In fact, time turned out to be the single pivotal factor. For both the best and the worst relationships, living together for more time was associated with higher quality relationships. In other words, those who lived together more of the time, had the better relationships – especially those who had lived together 30% to 50% of the time. In other words, both the best and the worst relationships would have been at a much lower levels had not fathers not had the greater time (30% to 50%) allowed to them. Five other recent studies confirm these results. A survey of 400 university students revealed that of the 80 students who had lived in dual residence families almost all, 93%, said this had been the best parenting plan for them, compared to only 30% of the other students. Nearly 70% of the sole residence students felt it would have been in their best interests to have lived more with their father. More than half (55%) said their fathers had wanted equal residential custody, but their mothers had opposed it. Even those who spent two weekends every month with their fathers said this was not nearly enough time together. The dual residence children had closer relationships with their fathers and their mothers than the others (Fabricius, 2003). Similarly, 3 years after their parents’ divorce, 80% of the children in the 597 shared parenting Wisconsin’s family survey were spending just as much time with their father and were more satisfied with their relationship with him. In contrast, more than half of the children in sole residence families were spending far less time with their fathers and were unhappy about this loss. A number of their relationships had ended altogether (Melli & Brown, 2008). Linda Nielsen then cites a study from the Netherlands, involving 135 children in shared parenting families. This study, by Spruijt & Duindam (2010), found that children in shared parenting relationship had as close a relationship with both parents as the 2,000 children from intact families. The father-child relationships were closer than those when the father regularly spent time with the children who lived with their mother (as in mother-custody scenarios). While a survey of over 9,800 is large enough to be an accurate guide, phrases such as ‘well being’ and ‘parental conflict’ are vague enough to be stretched to one’s own purposes. One also has to question the claim of never having ‘conflict’ in single mother households. Is there ever a time when ‘children living in single mother’ households do not fight or have conflict with one another ? Why does Dronkers appear to draw comparisons between intact two parent families (where there is conflict) and single mother households where there is none ? However, a fuller reading of Dronkers’ 1996 paper reveals a different picture. Although written almost 20 years his overall findings confirm much of the shortcomings of divorce and single parent upbringing and endorse thatI have laid out in my speech today. A moment ago I mentioned the Wisconsin family survey involving 597 shared parenting families and an equal number of maternal residence families. Coming more than 10 years after Dronkers’ 1996 paper the shift in attitudes is palpable. It has often been asserted but no proof offered that shared parenting needs a great deal of co-operation if it is to work and that it is suitable only for educated and wealthier families, i.e. some form of elite. However, the Wisconsin study – undertaken by Melli & Brown, in 2008 – found that the shared parenting couples were not that much more wealth, not that more educated, nor were they that more co-operative than the other divorced parents in the study. Just as an aside, the incomes levels shown in the adjacent Table partially reflect the finding of Gilder, Hewitt and Amneus some 40 years with regard gender and marital status (see ‘wealth creation’ above). In both groups shown here the mothers’ incomes and educational levels were virtually the same,at$23,000 versus $22,000 for shared versus maternal residence respectively. The percentage of college graduates, at 25%, among both sets of women gives no intrinsic advantage – but which in the past many have claimed. However, the variable for fathers is in their income generation and level of education and reinforces trends seen in other large scale studies. In regard to money, it is important to note that in the Wisconsin study there has been an increase in shared residential custody for lower income parents. This is highly significant in cultural terms and social expectations. It would suggest – as Cook & Brown (2006), have pointed out – that this arrangement (i.e. shared residence), is becoming more widespread (indeed it was widespread in Britain in the form of joint custody before 1991). Do not run away with the idea that shared parenting is the perfect answer, where everybody comes out smiling and it has no drawbacks. It is not a perfect answer to custody allocation problems but it is more perfect then the present regime we have. For example, the above study (Wisconsin) while underscoring older studies in thatfathers in shared residence arrangements had more flexible, child-friendly work hours, however, the quality of the co-parenting relationship was not especially friendly. Some critics of shared parenting have always asserted that it work only where ‘both parents co-operate fully’ – well, apparently this is not true. The Wisconsin study found both groups (shared residence & maternal residence), were equally likely, in 15% of cases, to describe their relationship as “hostile.” Furthermore, most parents had a distant, business-like relationship that was not conflict free. In fact, the shared parenting couples were more likely to have conflicts over child-rearing issues (50%) than families where the children lived with their mother (30%), largely because these fathers were so much more engaged in the parenting. So the apparent downside is more conflict but it has to be remembered that the conflict is over the quality or style of child rearing not the absence of it by one parent. ‘Society’ wants fathers to be much more hands-on, much more “engaged” in parenting, so in the scheme of things this is a small disadvantage given the huge benefits accruing to the child of having two actively engaged parents. Benefits accruing from shared parenting are not restricted to children or to fathers but extend to benefit mothers and women with careers. Both parents, mother and fathers, feel less overwhelmed by whatever life throws atthem when shared parenting is adopted. Mothers in sole custody households reported being overwhelmed in 30% of instances compared with only 13% of mothers with shared parenting residence arrangements. (Luepnitz, 1991). Another source of criticism levels at shared parenting which needs to be laid to rest is the notion that children who live at two home addresses feel more unstable or more insecure than those who live with only one of their parents. The assertion is that these children live in a perpetual state of transience, carelessly being “shuffled” from one home to another. Is it destabilizing; is there any stress and if true, how stressful is it ? Does it affect girls more than boys, or vice versa ? No study can be found that directly compares levels of ‘insecurity’ or ‘instability’ by comparing children in both kinds of families. But of the research reviewed – and some of it is incorporated in this text – living in two homes does not appear to create a sense of insecurity, instability, or confusion for children. If there is an irritation-like element it takes the form of the inconvenience of moving home. Though not intended to compare types of family arrangements two studies of British children aged between 6 and 22 are helpful. Of the 117 children, 38 lived for an equal time with each parent and 35 lived every weekend with one parent and weekdays with the other. The interviews with the 73 children who were living in both parents’ homes revealed a diverse array of reactions. Most mentioned only the practical inconveniences such as having to pack-up clothes, toys, and school supplies; letting friends know where they were; keeping up with their things; and needing to be well-organised. As one might expect, adolescents who can be difficult for parents to parent and control tended to find the arrangement of two homes more inconvenient than younger children because it interfered more with their social lives. Most also said it took time to adjust to each parent’s household rules and make the emotional shift from one home to the other. Despite these inconveniences and the need to make adaptations, most preferred living in two homes to living with only one parent. But we have to accept that some children will find it ‘disorientating.’ But even among this group the appreciation of shared time with mother and father was recognised and valued. Some children were found to dislike moving back because they found one of the parents “more boring” than the other. At the opposite end of the spectrum were these that thrived on the routine of having two homes. Among these children it was found that they were the most relaxed and socialised of all children. Some critics of shared parenting do so because they claim it exacerbates litigation. They also claim that it adds fuel to the divorce industry professionals such as custody evaluators, mental health professionals resulting in cases being drawn out for months and each case costs the tax payer more than it should. But this is to misrepresent the truth. Sole custody to one or other parent will invariably induce a propensity for a legal challenge in order to regain some equality. Shared parenting in whatever shape or form, however, depends on cooperation, where both parents are ‘winners’ and agreement before reaching court usually by mediation. In that single correction of an untruth the cost saving to the tax payer is revealed, and the nonsense of supposedly exacerbating litigation shown to be exactly that. The overwhelming weight of research shows that two-parent families are best for children, and thatthere are serious problems for children in single-parent families. There is a poverty of research into the differences in outcomes for children living with single mothers or single fathers, but the small available sources suggest that men are likely to be equally good parents. Differences as parents between men and women are probably exaggerated. Only a few decades ago, parental mortality produced about as many single-parent families as are now produced by divorce (Popenoe, p. 78). Parental mortality only recently ceased to be the normal mode of parent loss, and only within a minority of the world’s cultures. Thus, from our deepest ancestral roots, fathers have evolved in a world that required them to be capable parents. “Beyond being merely a second adult or third party, fathers – men – bring an array of unique and irreplaceable qualities that women do not ordinarily bring.” (‘War Over the Family’, by David Popenoe, pub 2008). These include protector, and male role model. Daughters learn from their fathers how to relate to men and learn that they are worthy of love. “…in almost all of their interactions with children, fathers do things a little differently from mothers. What fathers do is not only complementary to what mothers do but … is by all indications important in it’s own right for children rearing.” (‘War Over the Family’, D. Popenoe p.122). “… an often-overlooked dimension of fathering is play. …the fathers’ style of play seems to have unusual significance. It is likely to be both physically stimulating and exciting. With older children it involves more physical games and teamwork that require the competitive testing of physical and mental skills. It frequently resembles an apprenticeship or teaching relationship: Come on, let me show you how. (‘War Over the Family’, D. Popenoe p.122). “…mothers’ play tends to take place more at the child’s level. Mothers provide the child with the opportunity to direct the play, to be in charge, to proceed at the child’s own pace. Kids, at least in the early years, seem to prefer to play with daddy. In one study of 2½ year-olds who were given a choice, more than two-thirds chose to play with their fathers.” (‘War Over the Family’, D. Popenoe pp.122 – 123). “A study of convicted murderers in Texas. . . . . [found that] 90% of them either didn’t play as children or played abnormally.” (‘War Over the Family’, D. Popenoe p.123). “It is ironic that in our public discussion of fathering, it’s seldom acknowledged that fathers have a distinctive role to play. Indeed, it’s far more often said that fathers should be more like mothers (and that men generally should be more like women – less aggressive, less competitive). While such things may be said with the best of intentions, the effects are perverse. After all, if fathering is no different from mothering, males can easily be replaced in the home by women. It might even seem better. Already viewed as a burden and obstacle to [female] self-fulfilment, fatherhood thus comes to seem superfluous and unnecessary as well.” (‘War Over the Family’, D. Popenoe p.124). These indispensable attributes of fathering are persistently disregarded in feminist gender analysis of parenting and all feminist literature. Disregarding the many nuances of parenting cannot avoid negatively impacting on custody and the well being and life chances of children everywhere. Kathleen Kiernan “The Legacy of Parental Divorce” CASE, 1997. Patricia Morgan, “Farewell to the Family?” IEA, 1996. Dennis N. “Families without Fatherhood”, IEA. Bradshaw, J. and Millar, J. (1991) Lone Parent Families in theUK, Department of Social Security Research Report No 6,London: HMSO. Seltzer J, “Father by law: effects of joint legal custody on non-resident fathers with children” Demography, Vol. 35, No 2 May 1998. Seltzer J, “The father’s role after separation”. Seltzer, J. A. (1991) ‘Relationships between fathers and children who live apart: the father’s role after separation’, Journal of marriage and the Family, 53, 79-101. Seltzer, J.A., Schaeffer, N.C.and Charng, HAW. (1989) `Family ties after divorce. The relationship between visiting and paying child support’, Journal of Marriage and the Family, 50, 663-677. Sutton, T (1996) `A socio-economic approach to Child Support Compliance’, Paper presented to the Australian National Family Research Conference, Brisbane 1996. Amneus D, “The Garbage Generation”. Clarke, L. (1996) `Father figures – research data comes on stream’, Family Policy Bulletin, November. Marsh, A. (1993) Absent parenthood (unpublished paper). “Mean Overall Behavioural Problems scoreper child aged 5-17 by family type and selected demographic and social characteristics:United States” 1988.
of Risk and Protective Factors “, Journal of Marriage and Family, Vol. 52. Lummis, “The Historical Dimensions to Fatherhood: a Case Study 1890-1914, in, The Father Figure”, Tavistock 1982. Wright, “Sexual Unions and Infant Mortality in Jamaica”. Unpublished manuscript.University of Glasgow, 1994. Manderbacka, “Marital status as a Predictor of Perinatal Outcomes in Finland”, 1992. Dawson, “Family Structure and Children’s Health:United States” 1988, Series 10:178. Lamb, “The Role of Fathers in Development”, 1981. Cox, “Marriage Adult Adjustment and Early Parenting”, Child Development. Vol. 60. 1989. Greenstein, B, “The Fragile Male”, Papers and unpublished studies, 1992. Capaldi & Patterson, “Relations in Parental Transitions to Boy’s Adjustment problems in a Linear Hypothesis, ii) Mothers at Risk for Transitions and Unskilled Parenting”, Developmental Psychology, Vol. 27, 1991, pp 489. Ferri, “Step Children”, NFER 1984. Popone D. “Divorce and the Kids: the Evidence”. 1994. Sampson R., “Urban Black Violence: The Effect of Male Joblessness and Family Disruption”, 1987. Kissman, Kris “Non-custodial Fatherhood: Research Trends and Issues”, Journal of Divorce & Remarriage, v.28, n.1/2, pp.77: Publication Date: 12-31-97. Riley & Shaw, “Parental Supervision and Juvenile Delinquency”. Home Office No 83, 1985. Dominian J, “Marital Breakdown and the Health of the Nation”, One Plus One, 1991. Stack. S. “The Impact of Divorce on Suicide inNorway”. 1951-1980. Journal of Marriage and the Family. 1989. The Effect of Suicide inDenmark1961-1980. The Sociological Quarterly. 1986. [*] denote contrary, i.e. pro-sole mother custody views. * Coote, Harman & Hewitt, “The Family Way”. IPPR 1990. * McLanahan, “The Consequences of Single Parenthood for Subsequent Generations”. 1988. Winnicott, 1951 essay “Transitional Objects and Transitional Phenomena,” Transactions that constitute love between two imperfect people. The imperfectlyattentive mother who does a better job than the “perfect” one who risks stifling her child’s development as a separate being. Bowlby’s famous 1952 study for WHO (World Health Organisation). Gilder’s withering appraisal of state provided child care by referring to by Bowlby’s studies (see Maternal Care and Mental Health and Deprivation of Maternal Care (New York, 1966). An American developmental psychologist known for her work in early emotional attachment. ‘Infants without Families’, by Anna Freud and Dorothy Burlingham, 1943. Aichhorn was an advocate of the idea that there was a distinction between manifest and latent delinquency, and believed that arrested development in youth was a precursor to antisocial behaviour. He also believed that this situation was caused by disturbances in early child-parent relationships. See also “Abolition of Marriage”, Gallagher, p 36-37. “The effects of parental conflicts and divorce on the average wellbeing of pupils in secondary education.” by Jaap Dronkers, 1996.